The human nervous system is actually a specialized network that contains more than billions of neurons which are responsible for the control and coordination of all the functions of the body. The nervous system consists of two things: the central nervous system and the peripheral nervous system. In this essay, however, we will talk about the central nervous system and the process by which it works. The central nervous system consists of a primary unit called the neuron or the nerve cell. These millions of neurons are what allows for the various parts of the body to move along and coordinate with one another through the brain and the spinal cord. These particular nerve cells are usually coated with a fatty material, commonly called the myelin, which is the thing that insulates these nerve cells and helps them to send the signals to each other easily. The central nervous system, or the CNS, is usually covered in meninges which is a three-layered protective coat that is able to separate CNS from the rest of the body. This is the one that controls the import and export of several other nourishing substances and other pivotal electrolytes. It also prevents other potentially-harmful material like viruses, bacteria and several toxins from entering the central nervous system. The brain and spinal cord are usually found covered by the cerebrospinal fluid that circulates between the two meningeal layers. These meningeal layers are called the arachnoid and the pia matter. The meningeal layer that is thick and found on the outer side is called the dura matter, which acts as a protective shield for the CNS. 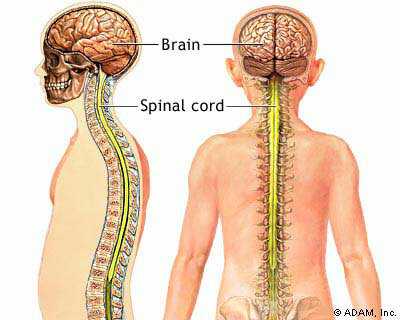 The anatomy of the central nervous system is composed of two main parts: the brain (cerebrum) and the spinal cord. The brain, or the cerebrum, is made up of millions of nerve cells that are clustered together and interact with one another through a process called neurotransmission. These neurotransmitters are the ones that control most of the bodily functions like movements, speech, thoughts, memory, and sensation. The cerebrum is divided into three main subsections: the forebrain, the mid-brain and the hindbrain. These parts work together to make the brain function more effectively. Eight cervical segments that signal the movements to the arms, neck, head, and shoulder. Twelve thoracic segments which consequently send signals from or to the arms, posterior and anterior chest, and the abdominal areas. Five sacral segments to send signals to the buttocks, lower back, pelvic organs, genital areas, and some other areas in the legs and feet. The central nervous system actually plays a very important role in the control of the human behaviour, allowing people to function easily and effectively.